What is God already doing? I stumbled across this video from PovertyCure, an organization that facilitates the global conversation on poverty and equips its participants with resources that promote lasting, enterprise-based solutions that affirm the role of individuals and families in turning around their situations. The video introduces their recently launched toolkit that equips groups to make a positive impact on those they serve, both locally and globally. I particularly enjoyed what Peter Greer, President & CEO of Hope International, said: "Instead of us trying to start something, start from a humble posture saying, 'What is God already doing in that community, and how can we simply help that?' It's time for a changed approach to missions." "What is God already doing?" I love that question, and this ministry is a response to that question. When I first approached our mission partner, Larry and Diana Owen with Waves of Mercy, I was considering a microloans ministry. I had read a lot of articles about microloans, and thought it could be beneficial in Port-de-Paix. When I told Larry and Diana, they said what people really needed in their area was job skills and training so they could get good paying jobs to provide for themselves and their families. They told me how sewing, and other vocational skills, could make a real difference in their area. Waves of Mercy already has several programs - street boys, nutrition, church, elementary education and community outreach - but they didn't have any programs geared toward adult education and job training. The Haiti 323 Project was a natural fit, and it plays into what God is already doing through their mission and in their community. I know God knows what He wants to do in Port-de-Paix far more than I do. So I'm trusting Him to lead this ministry, and while sometimes it's a challenge, I wouldn't have it any other way. Psalm 78:4 is one of my favorite verses. 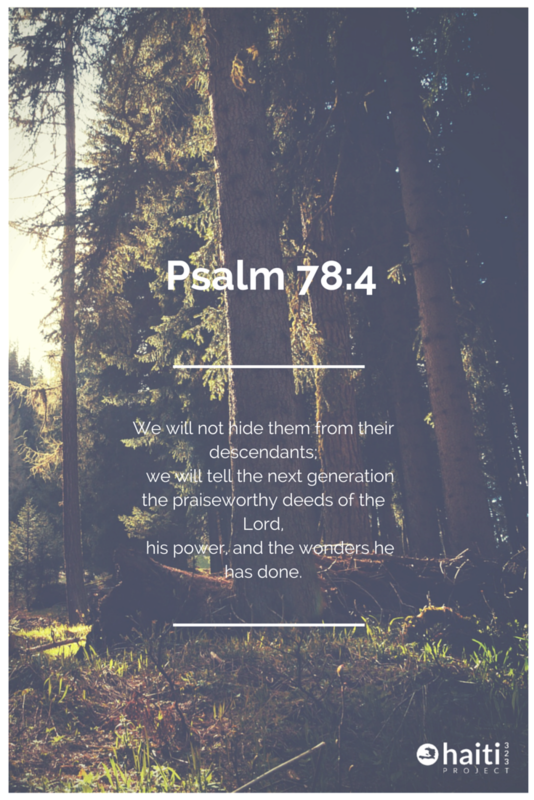 It says, We will not hide them from their descendants; we will tell the next generation the praiseworthy deeds of the Lord, his power, and the wonders he has done. "The praiseworthy deeds of the Lord." "The wonders he has done." In this world, it is all too easy to take credit for something you didn't do. For example, this ministry is here today, because of God. Not me. He gets ALL the credit. I get the blessing of being chosen, for some unknown reason, to help bring it about, and I am honored. The praiseworthy deeds of the Lord. The wonders HE has done. I look forward to sharing with you all that God does through this ministry. To Him be the glory!